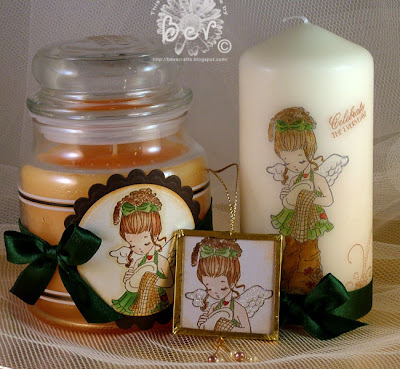 Katharina set us a challenge for this months project of the month - to decorate a candle. Now candle wax and a heat gun together conjure up the stuff of nightmares for me lol - just as well it's Halloween then! I decided to not only do a stamped candle but to make a matching microscope slide ornament for my Christmas tree (I love Christmas and have 100's and 100's of baubles - watch this space when me tree goes up next month lol). 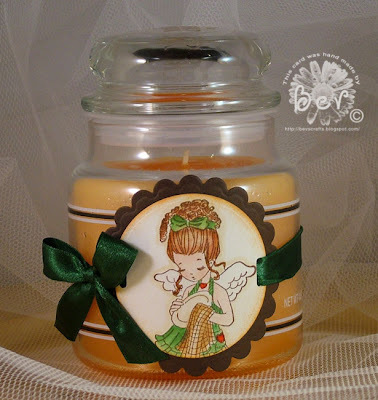 I also love Yankee candles but feel the sticker on the front could do with covering up so made a label to cover their brand sticker. 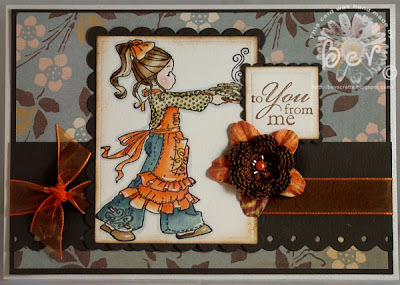 I used Melinda Helping Angel as my main image and went with autumnal colours. 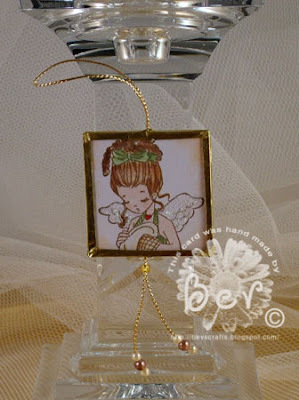 I used a Whiff of Joy sentiment stamp and also used a Stampin Up scroll stamp to balance the image by placing the scrolls either side. I stamped Melinda out, painted with distress inks and H2O's, chalked around the edges of the circle to age it a bit. I punched holes on either side of the circles to thread the ribbon through. Really quick and easy and so effective I think. I love working with microscope slides so made one to complete my little set. Scroll down for pics and instructions on how I did it. 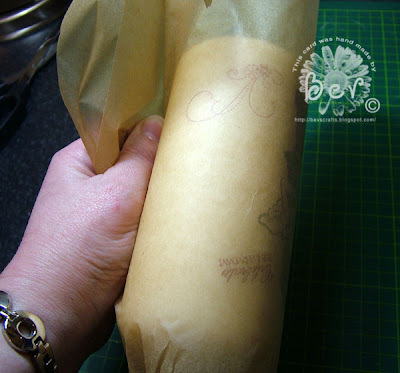 I didn't have any greaseproof paper so had to use baking parchment - it seemed to work okay. The trick was keeping the paper taught whilst heating with a heat gun and trying to check that I didn't have a gloopy mess instead of a candle. For the Microscope Slide I used Memory Glass slides, Memory Foil tape (self adhesive) and a couple of images painted with distress inks and H2O's. Before painting I placed the slides on to the image and traced around and just painted the bit I needed. 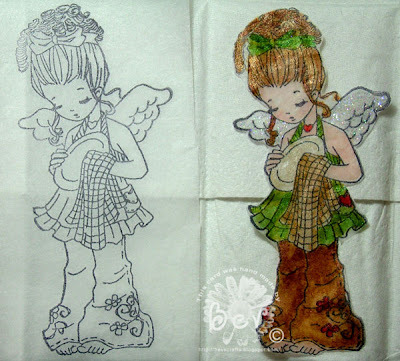 Cut this out and distress the edges with chalk inks or distress inks and glitter the wings. Make sure that you don't touch the sides of the glass that are going to be on the inside else you will have fingerprints on the finished slide. Run some gold cord on the back of one of the images having a loop at the top and excess at the bottom to thread some beads on, glue the second image back to back to the first one. Place the glass slides on both images. Starting at the top, run the foil tape around the slide. Once this is all in place start with the corners and your bone folder and work the corners in, giving it a good old polish with the folder to smooth the lumps and bumps. Once the corners are done work your way around the remainder of the slide with the bone folder, on both sides. 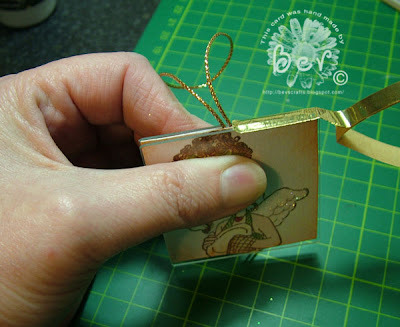 Take a cloth and give it another rub to make sure the foil is as smooth as possible. Apologies for the long post - hope this is clear enough - I'm not very good at explaining things. 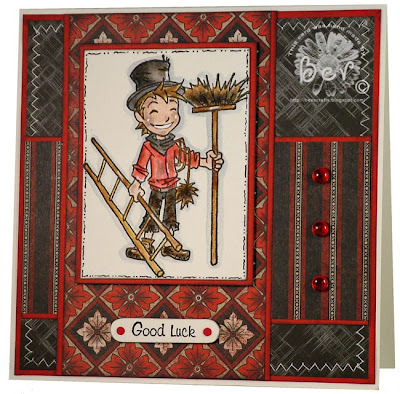 I realised this week that I hadn't inked up Good Luck Charlie from Whiff of Joy yet so have used him to make a card for this weeks Friday Sketchers challenge which I have just managed to get in on time! A chimney sweep is just not a chimney sweep without a grubby face, so my good luck Charlie is really sooty lol. Please only enter ONE candy draw - there are 7 DT members and 7 lots of candy but you will only be eligible for ONE entry. The candy is open to all and Donna will post worldwide. 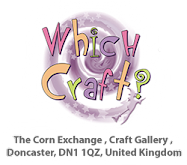 You have until 10pm on Saturday 1st November to enter. 2. Post about the new challenge blog on your blog and link to it. 4. Leave a comment on the new challenge blog with a link to your post and mention which DT candy you have entered. Each candy is different so it's important to state which draw you have entered. Donna will then use a random number counter on Sunday and go through all the DT blog comments to select a winner for each seperate candy. 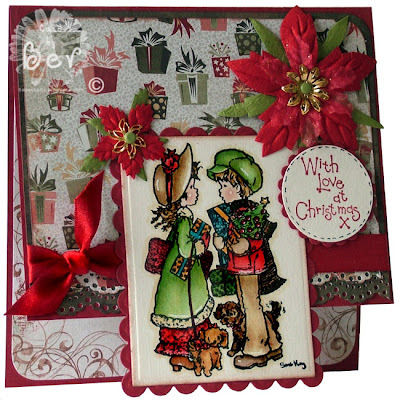 We have a colour challenge this week at Whiff of Joy Challenges and the challlenge is to use Burgundy (or red) and Green. Nice and easy one and I'm so looking forward to seeing what you all come up with. Dawn is giving away some blog candy to celebrate her 20,000 hits - way to go Dawn!! 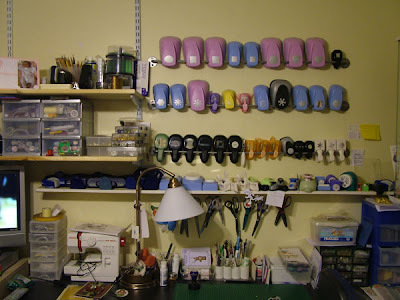 All you have to do is take a photo of your crafting space/room and if you're in the photo even better (and if you have any furry crafting buddies she would love to see them too~!!) - It's great to put a face to the name!!! - A winner will be chosen on Friday 31/10/08 at 8pm. 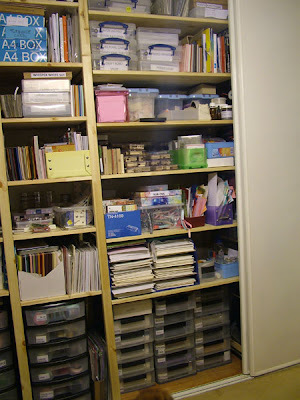 I read about this candy on Rach's blog and was ooh'ing and aah'ing over her fabby craft space - you lucky thing! 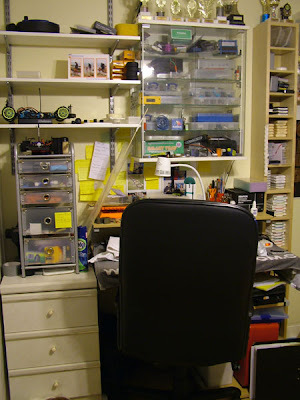 Don't all laugh now but here's my little window on the world, I have the back bedroom which I share with my hubby (although his little corner for his radio control cars, boats and planes is getting smaller and smaller, bless him). I keep all the stuff I use all the time in this room, but have plenty more in the other spare bedroom and the garage - it's frightening how much stuff you collect!! 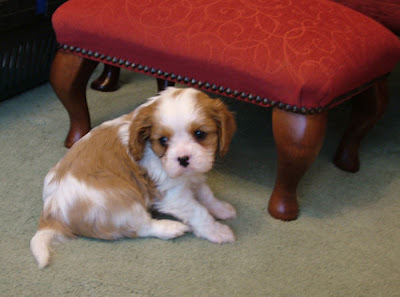 So without further ado, here's my little space Dawn - but first things first, meet Lady, our new addition to the family. She shares my chair with me - she hogs it and I sit on the very edge of it!! 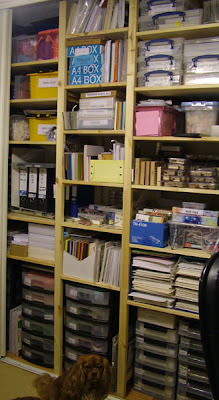 The enitre wall is one large cupboard with new shelving from Ikea, there are 3 sets of double sliding doors that hide the stash. I couldn't get it all into one pic without balancing on the bannister (not a good idea when you're my size!!!) so have posted 3 pics. 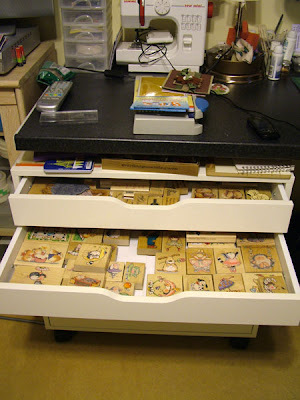 The drawer units on the floor keep my ribbons, some of the A4 card and embellishments. 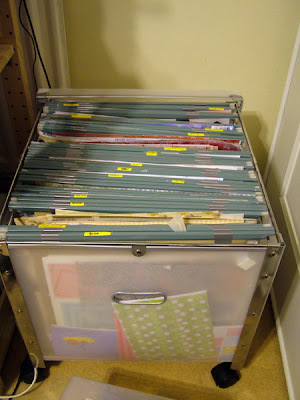 I love this 12 x 12 paper storage, only problem is I need a couple more but have not been able to source any in the UK boohoo. 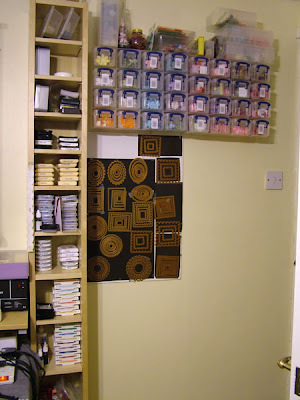 I have 12 x 12 shelving for the rest of the paper and card in the other bedroom so would love another couple to save me trailing backwards and forwards. 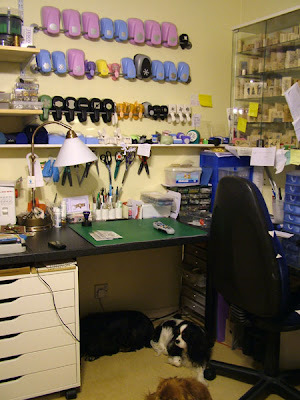 Hubby's wee corner and MESS! I'll be back later with another card. Whiff of joy does the treble except it's not a treble!! I had to do another combo today else I would never get all the challenges done that I want to - there seems to be new ones springing up almost every week and you know what a challenge junkie I am, I break out in hives if I think I can't get them all done lol. So, I've managed to combine this weeks Basic Grey which is shapes, This Thursday which is throw a curve and I've used the fab sketch on Dutch Dare - and have just realised it's last weeks sketch - doh!!! I also want to apologise for not leaving comments on your blogs - my modem is on it's last legs and I am waiting for Telewest to send the replacement (hopefully this week) so as soon as I ave it I will be able to leave comments. I keep on losing connection and having to reboot the modem which is doing my head in big time - never fear, you can't keep me quiet for long lol. I have coloured Matthew with present from Whiff of Joy with distress inks and H2O's (I had to use the light box tonight, the clocks going back is doing nothing for my photography skills - so unfortunately the H2O's are showing very shimmery which they are not IRL). The sentiment is also from Whiff of Joy and has been punched with a SU Word Window punch. The papers are the yummy Basic Grey Offbeat papers (from the 6 x 6 pad). 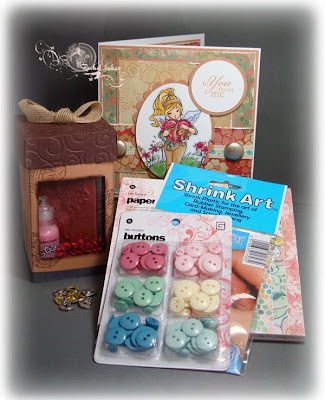 The Zoomz are from Stamp Galaxy and the snowflakes are punched with Martha Stewart and Dovecraft punches. 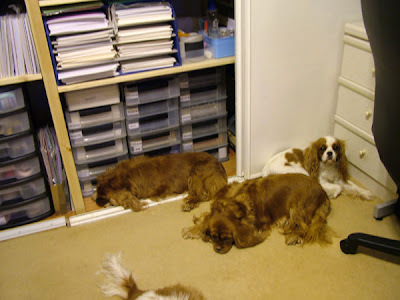 The challenge this week on the Sarah Kay challenge blog is to incorporate animals into your card. I love this image, these little doglets remind me so much of my Rosie and Roxy so I just had to use it. 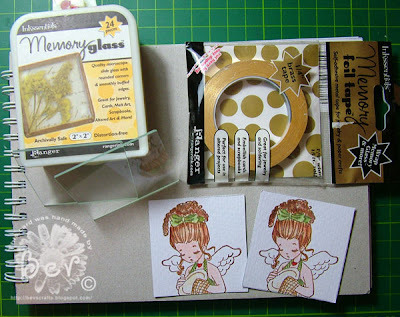 I've gone with another kick-stand card, love these - they are so quick and easy to make. I have coloured the image with distress inks and H2O's (yep - again) and have used the delish Basic Grey Wassail papers. I've stamped the insert (also BG Wassail paper) with a HOTP scroll stamp. 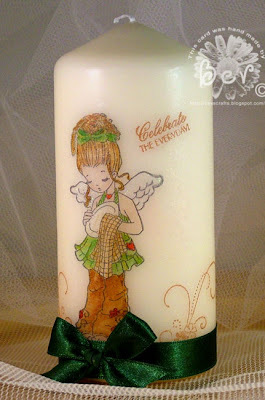 The sentiment is from the Lili of the Valley Xmas set which I got from The Hobby House. The borders are punched with my Martha Stewart lace doily punch. Flowers, etc from stash. 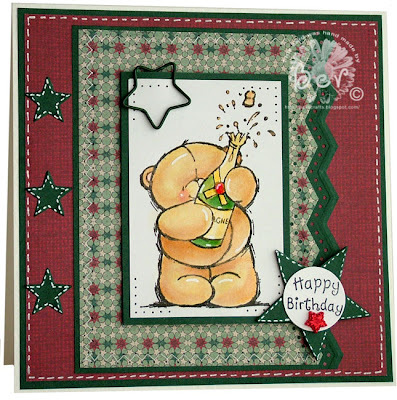 The challenge on Cute Card Thursday is stars at nigh - something spooky or stars. I don't do Halloween cards as a rule so have gone with the stars theme. I built the card around these HOTP papers from an old QVC kit, think the colours are great for a man's card. I've gone for overkill with the stars lol, but the left border looked a bit bare so I decided to put the sizzix stars along that edge. I coloured the image with the usual distress inks/H2O's. 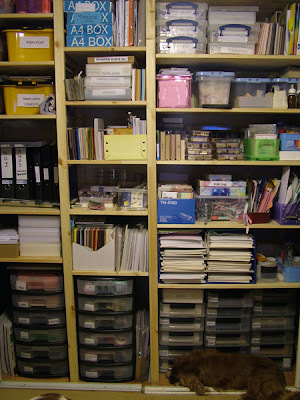 The papers are from the QVC HOTP TSV from last year (I think). The star clip was in amongst a fab surprise gift off my friend Alice. I thought the burgundy paper looked a bit bland when the card was assembled so I doodled some stitching around the edge with a gel pen. The zig-zag border is a Martha Stewart punh - love this one, it embosses as well as punches. 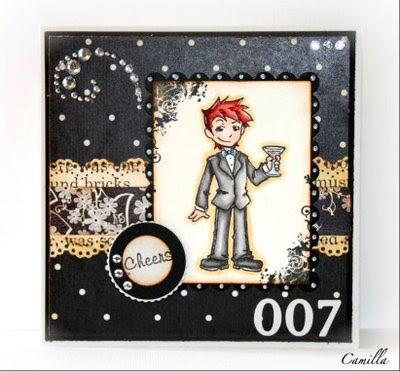 Hop on over to Camilla's blog and enter her candy give away - it's nothing less than the super suave 007 Charlie from Whiff of Joy stamps!!!! 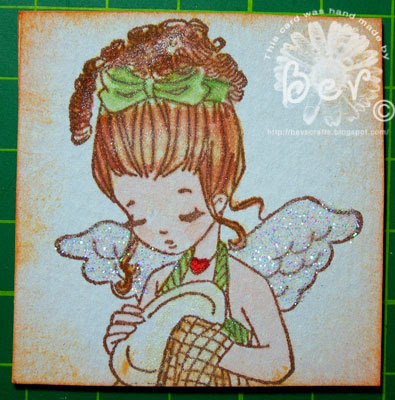 Here is Camilla's card made with the stamp - hasn't she done the most amazing job!!!!! I'm entering this card in Mojo Monday challenge. I struggled with this one - I'm so used to making square cards, the image was stuck down and lifted again that many times I had to replace the sticky pads lol. 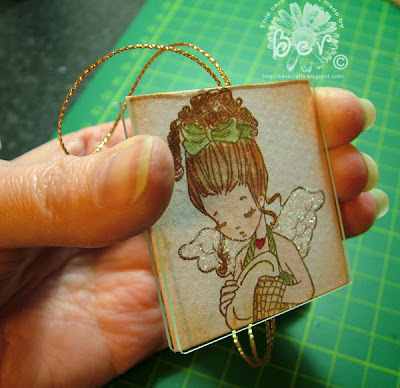 The image is the gorgeous Willow with Cookies from Whiff of Joy which I have coloured with distress inks/H2O's. The paper is Cosmo Cricket Gretel - Autumn which I got from The Hobby house. 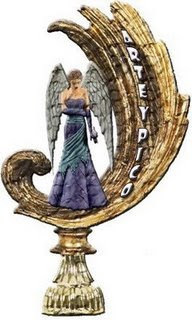 I have also received this award from Debby, thanks so much hunny. I've already passed this on so if anyone hasn't got it please help yourselves. ah KayI got my long awaited Sarah Kay Christmas stamps this week - woohoo!! I'm entering this in the Friday Skatchers challenge - love the sketch this week, it's brilliant! Apologies for the pants photo, the colours are a lot more pink IRL instead of the tomato juice red the pic is showing!! The little spacers I got from Mandy at Sparklybits - they are gorgeous and just perfect for the snowflake centers. She has them in gold and silver and they are cheap as chips. 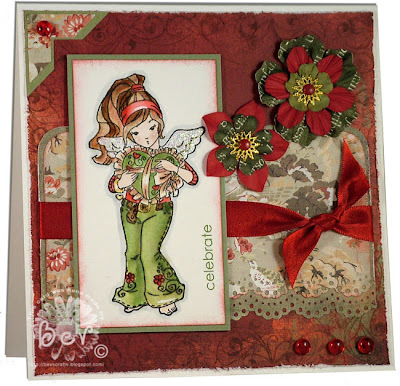 The Whiff of Joy challenge this week is a fab sketch by Heather. 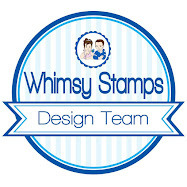 Please go and take a peek at the DT cards, they are truly fab! 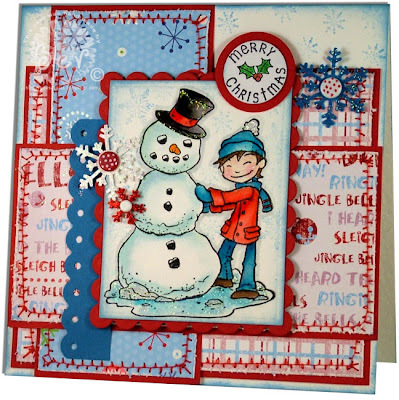 For this card I've used Charlie building snowman from Whiff of Joy and I've coloured the image with distress inks and H2O's. The papers are DCWV Christmas stack from last year. The sentiment is Cuddly Buddly and the snowflake stamps are Rubber Stamp Tapestry. Please excuse the appalling sewing, my sewing machine decided it didn't want to play tonight - just when I didn't need that!! It's stitched a pattern that is not even an option GRRRR!!! Let's just say we're not the best of friends lol. 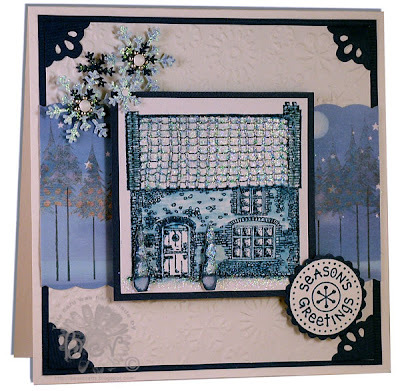 Secret Crafters challenge this week is "Blue, White and a little bit of snowflake!" so I thought the Kadoodle Flint Cottage stamp would work great with this challenge. All it took was a touch of glitter (okay - maybe more than just a touch lol) to transform the cottage to a winter scene. I stamped the Flint Cottage image from The Craft Barn with Adirondak Denim ink and smudged the ink with a damp paintbrush. The topiary trees I have popped up on some silicone to add a bit of dimension. Loads of snowflakes - punched and embossed and even stamped. Rach has some yummy candy up for grabs!! 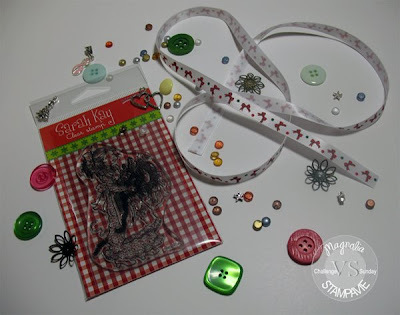 A Whiff of Joy stamp plus Basic Grey papers, charms, stickles, shrink art and buttons - so pop across to her blog and enter to be in with a chance of winning!! 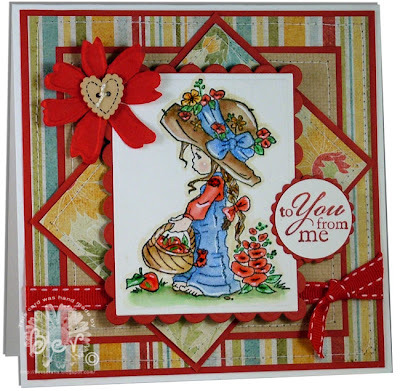 I've coloured the Sugar Nellie image from The Hobby House with distress inks and H20's. 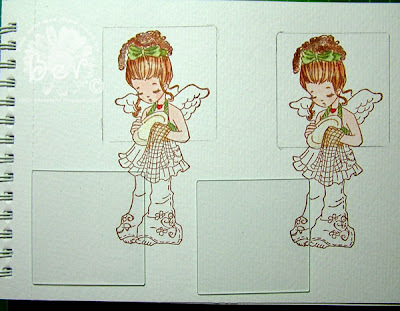 I have used the scrummy Bo Bunny Shabby Princess collection papers, and the beige layer is just paper that I have stamped using the Canvas background stamp from Stampin Up and Antique Linen distress ink - I need to lie down in a dark room after using all these delish papers these past few days lol. Flower is Prima and the heart button is from my button box. And shock horror!!! Only ONE flower and no charms - I think I've lost the plot!!! 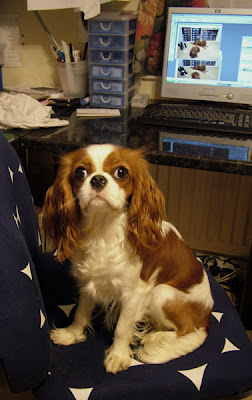 I also have some news to share - we've another Cavalier that has come to live with us, she is a year old and answers to Lady - I'll try and get some pics of her tomorrow. IN the meantime here's a couple of puppy pics snapped yesterday, not very good shots but they don't seem to get the bit about posing for the camera lol. I've not cropped the foot stool out so you can see just how little they are!! 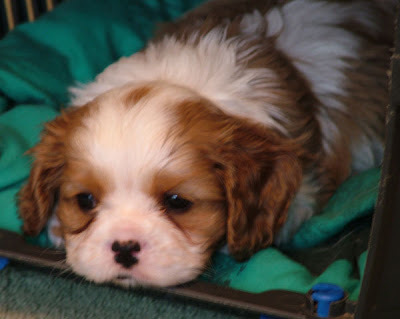 Sarah Kay & ABC Challenges and puppies!